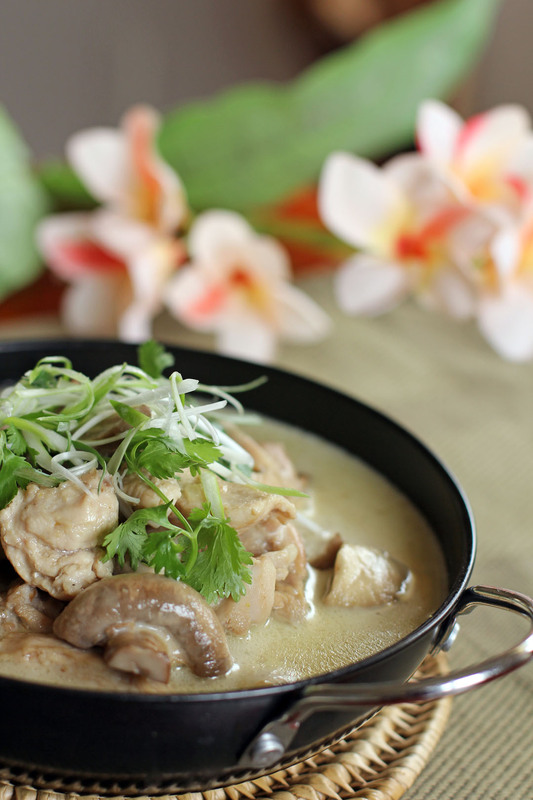 Thai Green Chicken Curry is a type of an Asian curry made out of chicken, vegetables, coconut milk and green curry paste. Its main characteristic is it’s colour which is uncommon for curries which we usually associate with red or orange colours, the green tint is coming from a blended herbs and spices which includes green chillies, lemongrass, garlic, galangal, shrimp paste, kaffir lime peel, coriander, cumin, turmeric and pepper. Traditionally they are made by pounding the ingredients in a mortar and pestle but due to modernization food processors or even ready-made paste are now used. I will definately going to try it!! LOL You do exactly the same as me, except I don’t add mushrooms, green beans i feel give a great deep green colour against the sauce. Raymund: I am crazy over curries…This one looks superb!!!! Have a great weekend! Sounds like a delicious dish, especially with the mushrooms! [laughing] I always mix my own curry pastes according to what I am going to cook. Oddly enough not that of Thai Green Curry, tho’ that appears on the menu often enough!! I guess I have usually found some ingredient necessary missing 😀 ! I agree with some readers above: green beans seem a given and I have never used mushrooms – i guess, why not!!!! What a beautiful dish. I’d love to try doing it, except that I’m not sure if I can find the Thai green curry paste easily around here. Of all the Thai curries, green is my favourite! It’s herbaceous, spicy, so flavourful! Simply delicious! wow your photographs today with the flowers in the background makes it extra pretty! I can taste the goodness in the bowl! Gorgeous dish! I love any kind of curry, and Thai ones are some of my faves. Good stuff – thanks. My favorite Thai dish :)! Now you’re talking! I love a good curry dish and this chicken curry looks delicious! Thai curry paste is one of my favorite condiments and I just the flavor it adds to a dish like this! Mmmm! I am drooling Raymund! Hi Raymund – I love thai green curry. The flavours are so fresh, and yet at the same time it has that wonderful heat. Sometimes it can be way too strong (I like mine a little more “easy-eating”) but it’s a classic with chicken. Never tried with mushrooms I think – like someone else commented I often add green beans or mangetout! Your recipe looks really creative but the real Thai green curry will never add lime. FYI though. Thanks for giving it a shot Judy!